More than 40 years ago, I wrote Carcere e fabbrica with my friend Dario Melossi. This work turned out to be a scholarly undertaking, a bit unripe in several respects. It received, however, unexpected acclaim, especially at the international level, when it came out in an English edition under the title The Prison and the Factory. Dario and I wrote the book in only a few months upon returning from a stay in England, and the initial spark for it came from a footnote we came across in Maurice Dobb’s Studies in the Development of Capitalism. In it Dobb mentioned two Frankfurt sociologists, Georg Rusche and Otto Kirchheimer, noting that in a work of 1939 they had investigated the historical connection between the development of the labor market and punitive systems. We felt compelled to look for this “forgotten” book and found a copy at the library of the London School of Economics. 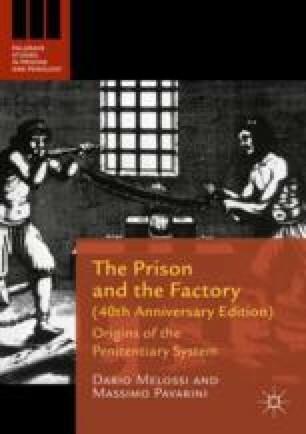 We immediately began work on an Italian translation of it, which came out one year after the publication of Carcere e fabbrica. Massimo Pavarini had written this chapter in Italian and had it translated into English shortly before passing away on 29 September 2015. The translation was done by Elisabeth Barili and was then revised by Filippo Valente and edited by Dario Melossi.